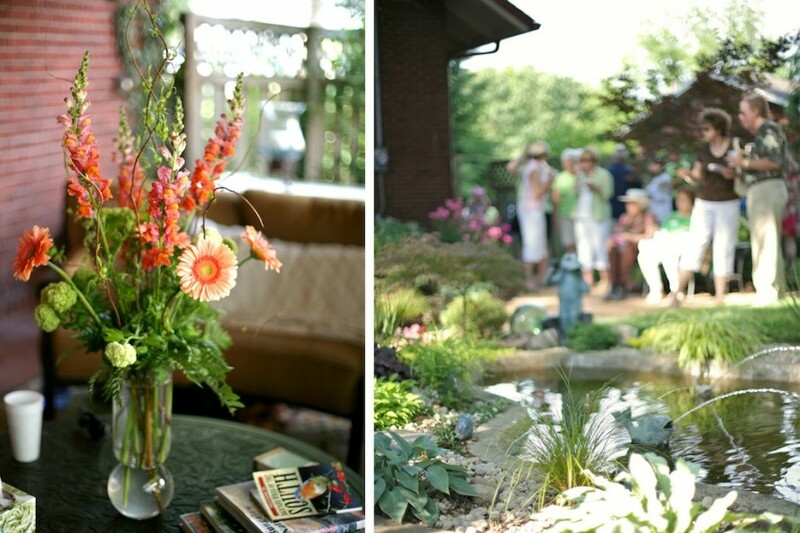 The lawn was buzzing with avid gardeners and enthusiasts swapping botanical tales. A glass of chilled white wine and bite-sized pastries were in most hands as guests explored the grounds. The most attractive potting shed graced one corner, sparkling with repurposed windows salvaged from the home during a remodel. I fell in love with the lush emerald lawn as plush as any expensive rug, almost inviting you to curl up for a nap. The opposite corner, a terrace offered seating and shade from the warm Tennessee sun, not to mention a fireplace to lounge by on cooler nights. The best tale of all was hearing how the 1920's fish pond was unearthed after years of hibernation! Thank you to Pat and Rachel Terrell for your hospitality and the Athena Delphian Club for hosting this lovely garden walk. Unfortunately, I do not have photographs of the second garden but if you missed my post featuring Jimmy Williams' Woodland Garden check it out here!